I am standing in front of a mom-and-pop motel in Eureka, Montana, when a rough-looking man on an oversized motorcycle roars into the parking lot, parks his Harley, stares at me and then at my puny bicycle. He is dressed in black and Hell’s Angel tattoos. I am wearing black spandex bicycle shorts and a sporty red T-shirt. “Where are you heading?” he asks, in an aggressive way. With that, he cranked his bike and roared away. In my 42-day journey across America, I will hear this “longing for the trip,” the desire to see the “real America,” so many times from so many different people. I will hear it from the struggling shop owners in Montana and North Dakota. I will hear it from some Native Americans across the northern High Plains. I will hear it from a couple of old black men playing checkers at a small country store in eastern North Carolina. I will hear it from the rich and hear it from the poor. What and where is this “real America?” For our purposes, we will define a journey to real America as travel that offers a mix of history, culture, and nostalgia, on roads and highways far removed from our larger cities and many miles from the nearest Interstate. With that in mind, let us take a closer look at a few of the figures and events that shaped our history and highways. We will begin with the exploits of our first trans-continental travelers, Meriwether Lewis and William Clark. In 1804, Tennessee was our westernmost state, Georgia our most southern, and little was known of the lands to the west of the Mississippi River. President Thomas Jefferson, with expansion on his mind, commissioned Lewis and Clark to explore the untamed land, to see if it might be possible to travel all the way to the Pacific Ocean. With the president’s checkbook in hand and his belief of what they might encounter in their minds—including woolly mammoths, erupting volcanoes, and mountains of pure salt—the explorers departed. Two years later they reappeared with 300 new species, tales of numerous Indian tribes, stories of the nearly impassible Rocky Mountains, and the sighting of the Pacific Ocean. During the next three decades, travel to the West slowly increased. Three famous stagecoach trails, the Santa Fe, the California, and the Oregon were established. Each of these “national highways” originated in Missouri, stretched for over 2000 miles, crossed dangerous Indian territories, and exacted the ultimate price—death—for a missed turn or bad decision. Of the many stories from this era, one stands above the others. In 1846, the Donner family traveled to Independence, Missouri, in the hopes of meeting other individuals and families who wished to form a large group for the treacherous journey west. Time was critical, for each passing date increased the risk of encountering dangerous early season snows in the Sierra Nevada Mountain Range. Finally, after excruciating delays, the 87-person “Donner party” forms. One week behind the recommended last departure time, they leave Independence for Sacramento, California. The torturously difficult route, as well as a series of missed turns and other miscalculations, cause the Donner party further delays. Now weeks behind schedule and low on food, they do not reach the mountains of California until late October. An early blizzard comes, and then another, in what we now know as one of the worst winters in the history of the Sierra Nevada. For five months the group is trapped in makeshift cabins on the eastern side of the Sierras. Without the requisite skills to hunt or fish, nearly half the group die and some resort to the ultimate taboo, cannibalism. Theirs is a story for the ages. We will take our leave of Lewis and Clark, America’s first highways, and the Donner expedition, skip over the many decades when the railroad and the stagecoaches co-existed, and travel to the early 1900s. It is easy enough to note that the legendary American businessman Henry Ford, by perfecting the “assembly line,” mass-produced affordable cars. It is more difficult to describe the profound impact his wildly popular “Model T” cars had on American history and culture. For the first time in world history, the working man can afford to buy what had previously been a luxury item—a car—and travel beyond his immediate neighborhood. C’mon dad, let’s go to the beach! In less than three decades, Ford sells over fifteen million of its Model T cars. The rutty dirt roads that once served horse and buggy are no longer adequate, so federal and state governments focus on improving our transportation infrastructure. 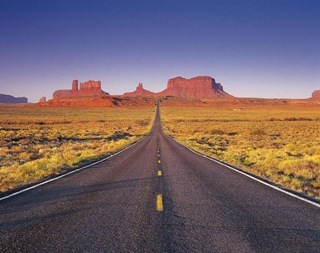 Not surprisingly, many of our early, paved national highways, such as US Hwy 1, a route the traverses the eastern seaboard, and US Hwy 2, a 2500-mile-long road that crosses our northern states, connect communities and facilitate commerce. Many miles of these now-century-old highways are still intact, but nearly all are of lesser importance due to the more modern Interstate system. One highway, however, deserves special mention. In 1926, construction begins on a 2,400-mile-long road that eventually will connect Chicago to Los Angeles. Much of it, by following portions of the old stagecoach roads, provides historical links to the days of the Oregon, Santa Fe, and California trails. The highway comes to be seen as the “Main Street” of America. John Steinbeck, in his 1939 novel The Grapes of Wrath, calls Route 66 the “Mother Road.” For tens of thousands of others, particularly those who flee their Midwestern homes during the terrify-ing dust storms of the 1930s, the highway will symbolize the “road to opportunity.” This highway is our iconic Route 66. Today, the Google query, “Route 66 T-shirts,” yields close to two million results! In addition to those practical, long-haul routes, some of our most splendid scenic highways are built in the 1920s and 1930s. In 1925, the National Park Service, wishing to accommodate the automobile-borne tourist, begins construction on Montana’s stunning, Going-to-the-Sun Highway. The road opens in 1932. In 1935, construction begins on the Blue Ridge Parkway, a magnificent, nearly 500-mile highway through the southeastern Appalachians. It is not at all necessary to travel great distances to experience either scenic beauty or historically significant roads. Many “heritage trails” related to life in the South can be found on local and statewide tourism websites. Nor is it even necessary to leave home. John Steinbeck’s book, Travels with Charley, is an American classic. Nearly as good is Bill Bryson’s humorous narrative, The Lost Continent: Travels in Small-Town America. When I turned the last page of the book, Ordeal by Hunger: The Story of the Donner Party, by George R. Stewart, I knew that at some future date I would make a journey, and I did. On an early December day in the Sierra Nevada Mountain range, I exit Interstate 80, drive a few short miles toward Truckee, California, and soon find myself in the empty parking lot of the Donner Memorial State Park. It is cold and clear. I find the ticket office and pay the entrance fee. “Quiet here right now,” I offer to the woman on duty. I follow her to a cluttered and stuffy room and watch what I already know. When the video ends, I exit the building. Since only a few inches of snow are on the ground, it is an easy and short walk to the Donner cabins. In the fading pastel light of the winter afternoon, I remove a glove and touch a piece of American history, and the end of a journey.